The entire concept of the Tropico series sits weirdly. You are the illustrious El Presidente, leader-slash-dictator of the banana republic of Tropico, a nation that spans a huge number of islands, presented to you in pieces and missions. Or maybe any single island is Tropico, and each mission represents a different timeline where the nation was founded on that particular island. Or maybe it’s some combination of both, but maybe it ultimately doesn’t matter, because you are El Presidente, and you decide what truth is. Your humble servant Penultimo presents each mission from the future, reminiscing about past glories with you, with some voiced dialogue setting up the scenario before letting you get to the task of nation building. These missions start on a decently realistic bent — seeking independence, dealing with the seedy criminal underworld, establishing a purer Communism — but eventually turn toward the more absurd, dipping into apocalyptic calendars, rogue AIs, and the supernatural. Imagine a scale, starting from one and ending at ten. Stretch it out so it’s big enough to plonk all the different types of city-building style of games across it, from the easier ones at one end, to the most difficult ones at the other. 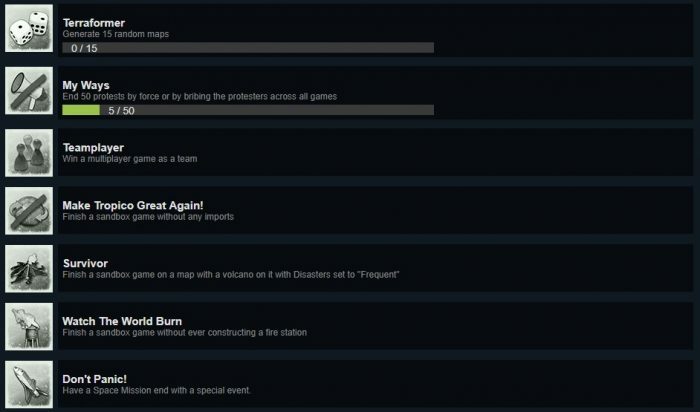 To me, the Tropico series falls somewhere before the middle point, on the easier side of things. Which isn’t to say it’s bad because it’s easy — some of my favorite games are even further along the left of this imaginary scale. Just that previous iterations of the Tropico series are what might be considered a bit easy. Tropico 6 starts out feeling the same way; an easy, relaxing experience, but a few missions in and things start to get amazingly difficult. Part of this spike in difficulty seems to be genuinely part of the game — without foreknowledge of mandatory quests, it can take a long time to prepare and produce what you need to move on. The other part is a mixture of pacing and glitches. 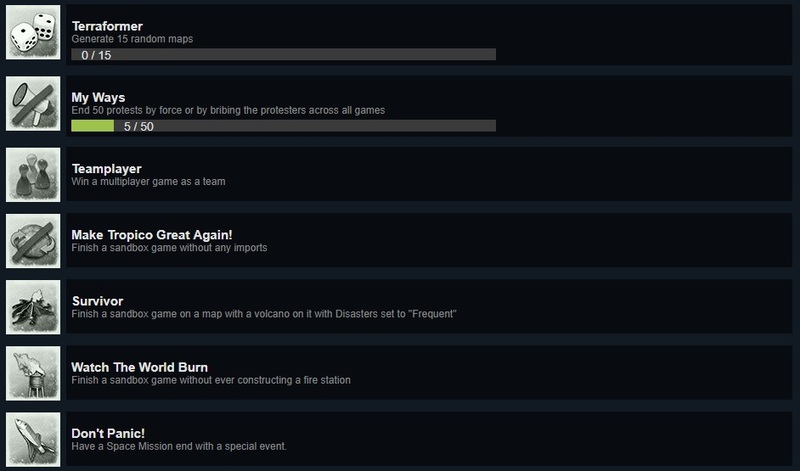 Some missions have quests that don’t pop until well into the late game, while others have missions that trigger, get completed, and then fail to actually complete and deliver the promised rewards. Flying trucks, fire or otherwise, seem to happen from time to time. None of the bugs I encountered were at all gamebreaking, just odd and occasionally irritating — a persistent sound bug when opening a menu caused a sound effect from that menu to loop every second for the duration of the activity that menu activated. A firetruck casually flew through the air, crossing the city to extinguish a fire instead of taking to the roads like a normal vehicle. An optional quest objective was completed and the quest just began flashing with a check mark for the entirety of the rest of the mission. The basic idea for almost any of the fifteen missions is simple enough. Build up your economy and balance your production against worker’s wages, transport ability, and public services to export enough goods to maintain a positive bank balance, all while progressing through different eras which are populated with internal and external political factions which need to be kept happy enough to not attempt a military coup or an invasion. The specifics may differ depending on the mission — one doesn’t let you build houses, for example — but the true city building experience is most prevalent in the free play mode, which is the mode you want if what you’re after is the gameplay without the pesky objectives. But like I said, the concept sits weirdly. 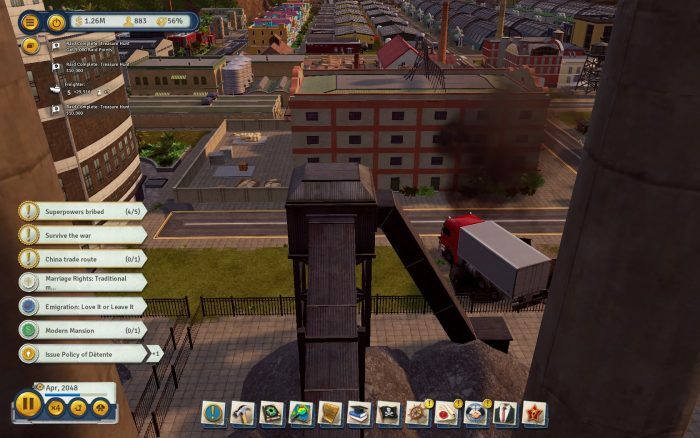 Tropico 5, the previous game, was released in 2014. In that magical time, which feels like decades ago, the idea of roleplaying as a dictator was a bit more amusing than it is these days, where the reality of current world leaders puts a bit of a damper on things like murdering political dissidents and arresting tourists. Sure, that’s timely. Why not. It’s not quite as bad as it could be, thanks to the absurdist direction the later missions go in, but the toolkit of the dictator is still there. If you’re the kind of person who can put that aside, however, Tropico 6 provides a deep level of micromanagement in designing Tropico the way you want; practically every building available can be researched to unlock numerous work options, which can provide benefits like siphoning money into a private Swiss bank account, or essentially inundating your people with propaganda to influence them towards joining a different internal political faction. Raid buildings, like the Pirate Cove, let you send squads out autonomously to steal wonders of the world, which can provide incredible benefits to your nation; such as pushing a high school education on everyone, or transmitting that aforementioned propaganda across the entire map without needing to build multiple radio and television stations to cover everywhere. A large number of presidential edicts can modify how the base game functions — get rid of speed limits so workers can get around faster, or pay a little extra to speed up all your boats. Look at those plantations. Making all kinds of exports. 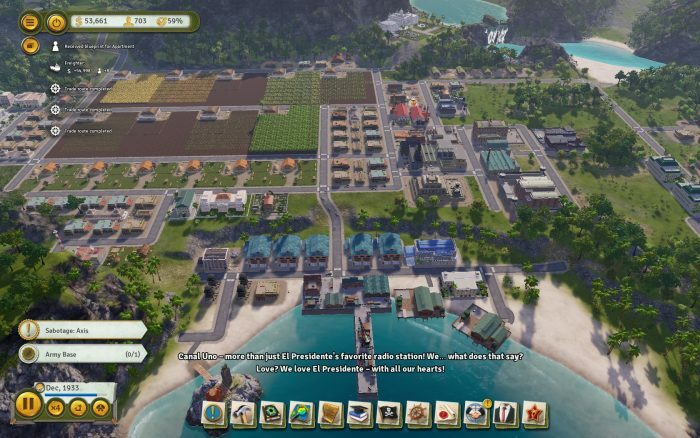 Politically, Tropico 6 tries to thread a line between humor and actual statement on the way the world works. 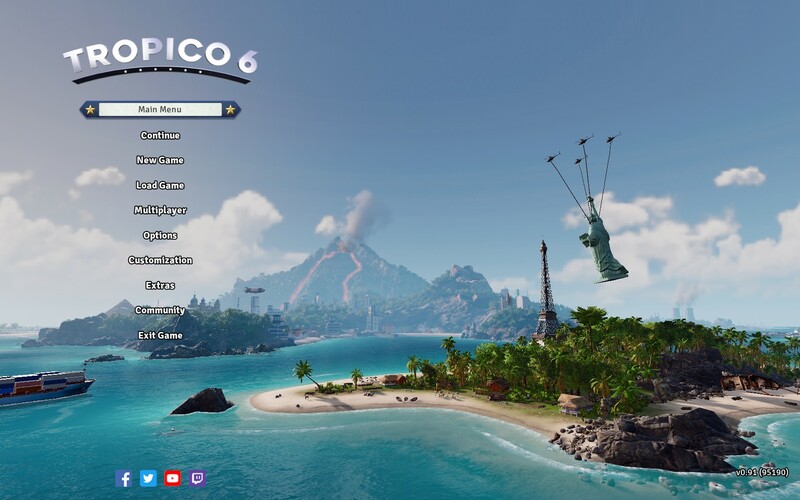 Mechanically, Tropico 6 plays fluidly while remaining easy enough to not turn away a more casual player. It could certainly say more, but even if it said nothing, it would still be fun to play.